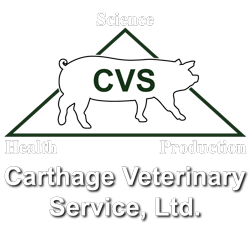 Please Save the Date to attend the Carthage Veterinary Service, Ltd 27th Annual Swine Conference held on Tuesday, August, 29, 2017! We will be hosting this year’s event on the scenic campus of Western Illinois University in Macomb, IL. This conference is known for providing quick fire sessions with cutting edge information that you can implement the day after the conference. It is designed to provide speakers and focused breakout sessions on Breed-to-Wean, Wean-to-Market, and CEO/Management in order for attendees to hone in on their interests. Sick Pig or Hungry Pig?